There are two kinds of video records: authentic (true) and non-authentic (false). Authentic video can be or has been validated, for example, notarized as part of an affidavit and therefore sworn under penalty of perjury. A few non-validated photos are displayed below for illustrative purposes and identified accordingly. 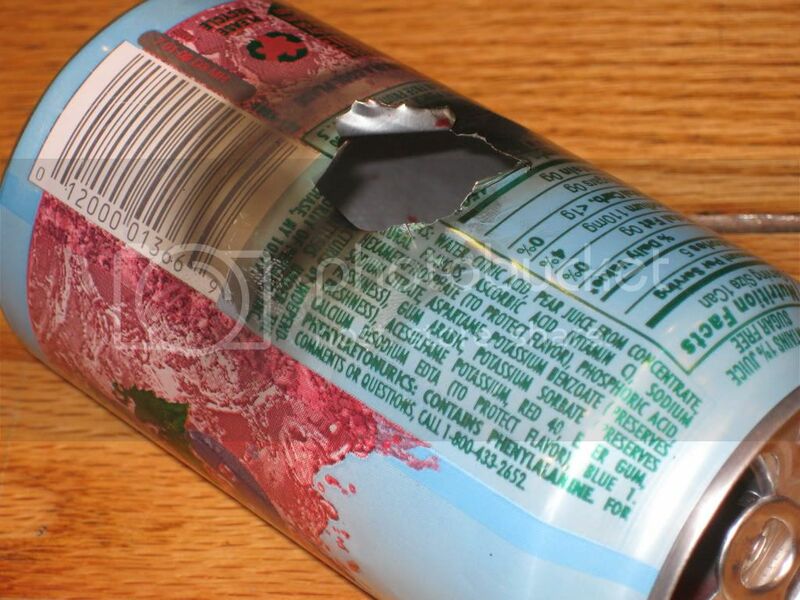 Example: razor-blade-slit gashes in an oversized aluminum can (Figure 2) is a poor attempt to mimic a DEW-made hole in John Hutchison's Red Bull can (Figure 1). Fake videos will not be accepted here as depicting real phenomena. Fake stuff is fake and has no or negative value. The fires seen near the toasted cars dont seem to ignite the paper. Some photos show firemen walking very or even through them. Are they cold fires? Sometimes the metal jellifies - other effects are also seen. Sometimes, materials subjected to the Hutchison Effect seem to change at an elemental level  could this be the explanation for the rapid rusting  steel is turned into Iron? Notice that the can bends and deforms, like its taking a bow. It "jellifies" momentarily. On Jim Fetzer's radio show, Ace baker even describes this anomalous bending and deforming that the can goes through. A video composite demonstrating Ace Baker's video fakery, which he has admitted to. Figure 1. 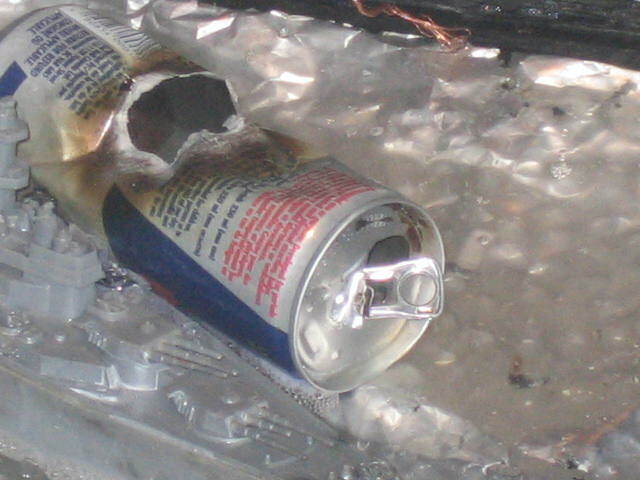 John Hutchison's Red Bull Can with damage resulting from multiple experiments of the Hutchison Effect. Source: Figure 2. Ace's make-believe Red Bull Can (larger than the Red Bull can and easier to cut) which has appears to have been damaged by razor blade gashes and candle smoke and perhaps needlenose pliers. Perhaps he thought that the larger can might make it easier to maneuver his razor blade. It can safely be assumed that this can was not damaged by DEW. Video 3. The Hutchison Effect producing anomalous fires on the boat. Shown at a presentation in Seattle, WA May 29, 2008. 1960 Formal schooling ends after grade 8 for a period of 3 years; lessons from private tutor in radio astronomy, physics and chemistry. Self-taught in physics, especially as related to Nikola Tesla's research. 1965 Electrical experiments using household circuit-outlet results in initial insights of energy production with Tesia-inspired technology. 1968 Production of three small free energy units with no input and resulting output of 10 volts at 500 milliAmps. 1970 Onset of larger-sized Lynn Valley laboratory, located in North Vancouver 13 tons of apparti include gravity antennas. Some personally developed set-ups are partly based on Tesla-inspired technology, along with one-of-a-kind test equipment acquired from army surplus supply. 1979 Breakthrough with anti-gravity Field and disruption in metals ~ lévitation of objects, transmutation in metals. First material testing results of metal samples indicate that In the disruption process, the energy required to produce effects was at least one billion times greater than the 4,000 Watt input used. The results are known as the Hutchison Effect by the scientific community. 1983 Start of U.S. Government interest. Demonstration of Hutchison Effect to U.S. Army Intelligence, and the Los Alamos Laboratory. Demonstration videotaped by these and other U.S. scientists. Metal samples taken for laboratory analysis. Test results were not released. 1984 Demonstration to Washington State University and Fort Worth Army Command, Texas. Interviews by BCTV News and other TV stations. 1985 Demonstration to McDonnell Douglas Corporation's Jack Houck, in cooperation with Los Alamos laboratories and U.S. Army Intelligence. Laboratory demonstration test results and video documentation of McDonnell Douglas Corporation (Department of Advance Systems and Technology) released. 1986 Canadian Scientific and Technical Intelligence Agency investigates Hutchison Effect. Further testing, leading to greater mastery of effect. North American and European laboratories indicate same results of atomic changes in samples. 700 demonstrations in 16 years. 1989 Invited by European scientists to Austria and Germany. During 2-year period, new discoveries in subatomic physics and in elimination of radioactivity. In 1989, Hutchison was contacted by Prince Hans Adam Liechtenstein expressing an interest in my experiments and research. Hutchison has been in communication with him since that time. In 1989, Hutchison had taken a trip to Germany to do some work at the Max Planck Institute. He planned to have equipment shipped over there, but during his time away, government officials took the lab equipment while it was in transit and while it was in the previous lab installation. Lawyers Hogson and Kowasky worked on Hutchison's behalf to get the equipment shipped safely by Rolf Kiperling. Judge Paris set up a B.C. Supreme Court order to protect the lab equipment. The Vancouver Sun ran the story of the lab equipment seizure on the cover of the Feb 22, 1990 edition. At this time, Henry Champ of NBC got involved in covering the story while Hutchison was in Germany. Around this time, George Hathaway, Col. John Alexander and some people at Sandia Labs (USA) and Washington D.C. were still involved in analyzing my experiments, but they did not intervene in the seizure of the lab equipment. Tour of California and New Mexico. Worldwide offers of research partnership; rejects all offers. 1990 Return to Vancouver to find the laboratory destroyed by Canadian Government officials. George Lisacase formed a company called Pinnacle Oil International and he stole some of the energy cell technology Hutchison had developed and used it for oil prospecting. George Lisacase also has/had videos of levitation demonstrations as well as photos of free energy tests and experiments. 1991 Scientists offer to participate in psychotronic research and in development of anti-Gravity propulsion; no interest expressed. Also around 1991, an article on the Hutchison Effect was published in several places - Raum und Zeit [Space and Time], the Newsletter of the Planetary Association for Clean Energy, the Electric Spacecraft Journal, "Extraordinary Science", and a publication called "Space Power". Film documentary on UFO's with Hutchison Effect aired in 20 countries. 1993 TVASAHI interview aired April 6, 1993 in Japan. Japanese book about Hutchison Effect published by Nobuo Yokoyama,as part of Tokyo Free Energy Project. Studies in theoretical physics of combining subatomic physics with space, time and energy. Model of Gravity Propulsion developed. March: Contract signed and partnership with International Energy, Kirkland, Washington. 1994 Hutchison Converter. Barium Titanate crystals resonating to extract 6 Watt continuous electric power output for about 6 months, until dismantled. 1995 Smaller-sized converter developed for Japanese tour, demonstrated in Hiroshima, before TV. Newer "dirt cheap" version developed, utilizing selected rocks in chemical solution. 1996 Laboratory assembled with electric and electronic gear salvaged from Canadian Navy vessels. Also around 1996 actress Caroline Allart felt the force fields from Hutchison's experiments with Barium Titanate samples. 1997 More levitation experiments were demonstrated to members of the company "Harry Delighter Productions" and they put these in a video called "Free Energy  The Hunt for Zero Point". 2000 Premises were raided by the local New Westminster Police Department and other people with them photographed things in Hutchison's apartment during the raid. Jim Cherry of "World Wireless Productions" (for Miramax motion pictures) witnessed the effect of the floor of Hutchison's apartment starting to buckle or roll. This event was also recorded on video. Jim Cherry was with a team that included a News Week reporter and one from TIME Magazine. 2001 On April 29 2001, some demonstrations of free energy experiments/technology were given to Hiroshi Yamabe of Japan and Thomas Messer of Germany. 2003 More demonstrations were given to Gryphon Productions TV for their "Beyond Invention" series and Wesley Baker was interviewed in the program, as he had witnessed similar demonstrations given by me in the 1980s. In the period 2004-2005, Bruce Burgess of Blue Book Films worked on another film project with Hutchison. Also in the period 2004-2005, Hutchison made attempts to retrieve copies of official reports about his experiments through FOIA requests in Canada and the USA, but nothing of value was released to him. Between June 2004 and April 2005, Hutchison experienced a significant increase in enquiries from a number of organizations such as NASA, the Pentagon and from SAIC. Some of them requested he send videos. Lama Lee, who lived quite close to Hutchison, reported to news crews about metal ornaments "dissolving" in her apartment, near the time he had done some of his experiments. Mayor M. Wright of New Westminster visited Hutchison's apartment because he said he had gotten reports of concrete breaking or cracking and citizens being in distress, apparently following some of Hutchison's experiments. April 2005, Hutchison spoke on Art Bells US "Coast to Coast" radio show and discussed the likelihood of the replication of his technology by other groups within the military. Japan TV aired a program called "x51. files" which included videos of Hutchison's experiments. Also, around this time Harold Berndt of Surrey, BC filmed some demonstrations of effects and posted a video on the American Antigravity Website. Also in 2005, Hutchison sent a video to the Air Force Division of the Pentagon and one to NASA. 2006 In 2006 a group from National Geographic TV filmed odd vibrations and fires during Hutchison's experiments. Also near that time, Nancy O' Donnell a TV director and others from Chinese TV saw and/or filmed melting rubber and steel during Hutchison's experiments. In 2006 several other groups filmed effects on Redbull cans and other effects on a toy ship. These effects included "lightning bolts" and water foaming. Again in 2006, videos of Hutchison's experiments were shown to 400 staff officers at the Pentagon and it received standing ovation. On Dec. 22, 2006 John Ealer of Motion Picture Productions came to film Hutchison's experiments for a program called "Earth's Black Holes" (which was aired on the History Channel in January 2008). 2007 In November 2007, Hutchison was visited by Dr. Ludwig of Germany, Jeane Manning, Peter Scholls and others and they took more videos of his experiments. Hutchison asserts that others who have expressed interest in his work, or offered letters of recommendation include Dr. Yaho, Caroline Sutherland, Joe Clark, Dr. Hal Puthoff (See Figure 8), Dr. Robert W Koontz (see Figure 9) and MP Chuck Cook (See Figure 2 and Figure 3). Does Jim Fetzer attempt to discredit John Hutchison? Fetzer makes no scientific argument with the evidence. *B.S. Civil Engineering, 1981 (Structural Engineering), Virginia Polytechnic Institute and State University in Blacksburg, Virginia. *M.S. Engineering Mechanics (Applied Physics), 1983, Virginia Polytechnic Institute and State University in Blacksburg, Virginia. *Ph.D. Materials Engineering Science, 1992, from the Department of Engineering Science and Mechanics at Virginia Polytechnic Institute and State University in Blacksburg, Virginia. Dissertation: "Determination of thermal strains in the neighborhood of a bimaterial interface"
Wood, J. D., et. al., "The Effect of Delaminations on the Thermal Expansion Behavior of Quasi-Isotropic Composite Laminates," Proceedings of the ASTM Symposium on Effects of Defects in Composite Materials, (December 1982). Wood, J. D., et. al., "Deformation of Composite Multispan Beam Shear Specimens," Proceedings of the Fifth International Congress on Experimental Mechanics, Montreal, Canada, pp. 297-298 (June 1984). Wood, J. D., et. al., "Relative Displacement Measurements for Two-Body Problems," Proceedings of the Society for Experimental Mechanics (SEM) Spring Conference, Las Vegas, Nevada, pp. 309- 314 (June 1985). Wood, J. D., "Detection of Delamination Onset in a Composite Laminate Using Moiré Interferometry," Composites Technology and Research, Vol. 7, no. 4, pp. 121-128 (Winter 1985). Wood, J. D., et. al., "Deformation and Strains in a Thick Adherend Lap Joint," Adhesively Bonded Joints: Testing, Analysis, and Design, ASTM STP 981, W. S. Johnson, Ed., American Society for Testing and Materials, Philadelphia, pp. 107-118 (1988). Wood, J. D., et. al., "Thermal Strains in a Bimaterial Joint," Proceedings of the Seventh ASCE/Engineering Mechanics Division Specialty Conference, Blacksburg, Virginia (May 1988). Wood, J. D., et. al., "Thermal Strains in a Bimaterial Joint: Experimental and Numerical Analysis," Proceedings of the Society for Experimental Mechanics (SEM) Spring Conference, Cambridge, Massachusetts, pp. 543-551 (May 28-June 1, 1989). Wood, J. D., et. al., "Determination of Thermal Strains by Moiré Interferometry," Experimental Mechanics, Vol. 29, no. 3, pp. 318-322 (Sept. 1989). Wood, J. D., et. al., "Micromechanical Study of Thermal Strains near the Interface of a Bimaterial Joint by Microscopic Moiré Interferometry," Proceedings of the Seventh International Congress on Experimental Mechanics, Las Vegas, Nevada (July 1992). Wood, J. D., et. al., "Thermal Stresses in a Bimaterial Joint: An Experimental Analysis," ASME J. of Applied Mechanics, Vol. 61, (no. 1), pp. 192-198 (March 1994). Wood, J. D., et. al., "Residual Material Properties in Aging of Composites," Proceedings of ASME Conference, Atlanta, Georgia (August 1996). Wood, J. D., et. al., "Designed Polymeric Interphases", Gordon Conference on Composites, Ventura, California (January 1997). Wood, J. D., et. al., "Aging of Polymer Matrix Composites: The Reverse Thermal Effect," The International Composites Expo (ICE) 1997, Nashville, Tennessee (January 1997) p. 14. Wood, J. D., et. al., "Effect of Sizing on Shear Properties of Hybrid Composite Materials Using Moiré; Interferometry," Proceedings of the Society for Experimental Mechanics (SEM) Spring Conference, Seattle, Washington (June 1997). Wood, J. D., et. al., "Effects of Temperature Sequencing During Hygrothermal Aging of Polymers and Polymer Matrix Composites: The Reverse Thermal Effect," Proceedings of the International Conference on Composites in Infrastructure (ICCI), Tucson, Arizona (January 1998). Wood, J. D., et. al., "Influence of Matrix Chemistry on the Short Term, Hydrothermal Aging of Vinyl Ester Matrix and Composites Under Both Isothermal and Thermal Spiking Conditions," Journal of Composite Materials (USA) Vol. 33. (no.20), pp.1918-1938 (July 1999). Wood, J. D., et. al., "Measurement of Strain Distribution and Viscoelastic Characteristics in Layers of a Soft-Core Sandwich Beam Using Moiré Interferometry," Society for Experimental Mechanics, Milwaukee, Wisconsin (June 2002). Wood, J. D., et. al., "Strain distribution within multilayer thermoplastic elastomers using Moiré interferometry," Society for Experimental Mechanics, Milwaukee, Wisconsin (June 2002). Wood, J. D., "Determining Thermal Stressess Near a Bimaterial Interface," Handbook of Moire Measurements, C. Walker, Ed., Dept. of Mechanical Engineering, University of Strathclyde, UK, Chapter 8: Residual Stresses (2), pp.287-293, (2004, IOP Publishing Ltd). Wood, J. D., et. al., "Designing a Perfect Bimaterial Interface," Society for Experimental Mechanics, Costa Mesa, California (June 2004). Wood, J. D., et. al., "Development of a Real-Time Microscopic Moiré Interferometry System," Society for Experimental Mechanics, Costa Mesa, California (June 2004). UPDATE: John Moffett backed out just before the show. Jerry Leaphart talked about the qui tam case. (0:09:59) URL Toy UFO on a string, activated by high voltage and electrostatics. musician: recorded on film playing tunes from his iPod. Shall we conclude he is a complete fraud? He uses this logic to promote "as proof" others are a fraud. Surely he does not apply a double standard. Ace Baker's graphic for Blown to Kingdom Come states on it, "a song about 9/11 by ace baker," yet this tune, with very similar words, is copyrighted song, Have You Forgotten. Here, someone named "ace baker" is clearly claiming to be the author of this song. "© 2003 - Darryl Worley / Wynn Varble - EMI April Music Inc./Pittsburg Landing Songs (ASCAP)." I've not seen him play keyboard. Are we to simply take his word for it? I have indeed seen him play a guitar. I won't judge how well or poorly he played. But, I can honestly state that he held what looked like a guitar in his hands, and appeared to make sound eminate from it. He may have even been "caught on film" doing this. But, that could have been video fakery. Actually, we can't be sure he was actually playing the guitar. He could be a fraud. Perhaps we should challenge him $100,000 to prove to our satisfaction that he's not a fraud. This is one of the VERY few links for an "Ace Baker" that could be found on the internet. It's odd that someone approaching 50 years old, who claims to have been a musician for much of his life, has left little evidence of his existance prior his involvement with 9/11. Ace Baker admitted he had been dishonest and deceptive about the videos he presented. Is dishonest a good way to find the truth about something? Jim Fetzer defends Ace Baker's presenting a fake videa as real, saying that he had a motive for doing this. Hmmm... I'm not sure, but it seems that in order to be convicted of having committed a crime, "means, motive, and opportunity" need to be demonstrated. Is Fetzer trying to convince us that if someone has a motive to commit a crime, it isn't a crime? That makes no sense! But then, again, we've only seen him juggle on video. So perhaps the juggling is also fake. Someone who lies about evidence has destroyed their credibility for the rest of their life. Curiously, Jim Fetzer dismisses John Hutchison for being "self-taught." But, Jim Fetzer hasn't even established if Ace Baker graduated from the eighth grade, much less high school or college. Jim Fetzer has not even established if "Ace Baker" is the real name of a real person who really plays a guitar. I wonder why Jim Fetzer found it more important to grill John Hutchison on his source of income every year for the past 40 years than it was to discuss the Hutchison Effect or why the US Department of Defense, scientist from Los Alamos, and US Government physicists visited his lab for four months, videotaping all John wasdoing, and the Canadian Department of Defense "classified it.". Jim Fetzer certainly wasn't interested in finding out Ace Baker's source of income every year for the past 40 years. Ace Baker claims to be "self-taught" in this area as well. Are we to simply take his word for it? Do Ace Baker and Jim Fetzer attempt to discredit or "debunk" John Hutchison? They make no scientific argument about the evidence. Ace Baker admits that Ace Baker makes fake videos. We can only wonder why so much effort has been made to discredit John Hutchison and his work. It has been often been said that the flack is the strongest when you're over the target. Ace Baker caught making fake videos -- and confessed to it. "Success! I have reproduced the Hutchison Effect! Group, This is very exciting. I have reproduced the Hutchison Anti-Gravity Effect." February 27, 2008, Ace Baker admitted he had lied and had made fake videos. 6 April 2008, transcript by "Archie"
Do Ace Baker and Jim Fetzer attempt to discredit or "debunk" John Hutchison with no scientific argument about the evidence? Ace Baker admits that Ace Baker makes fake videos. a NETWORK to improve life for both the PLANET and its PEOPLE! Segment 1 (8 min): various news real footage showing the achievements of John Hutchison. Segment 3 (40 min): Lecture and principles with Andrew Michrowski and Tom Bearden. A very interesting and unique video. Many people talk about anti-gravity, but no one can show the goods. John Hutchison does show the goods. 20 minuets of this video is actual salvaged 'levitation footage'. All the pictures from this site are snap shots of the video. John Hutchison is one of the very few that stands up to his claims and allows media to come in and observe. George Hathaway (1988): "The Hutchison Effect  A Lift and Disruptive System". Paper presented and published by the Planetart Association for Clean Energy, Hull, Ontario, Canada. Andrew Michrowski, Editor. Jeanne Manning. (1992). "Rainbow in the Lab: The Hutchison Story," Electric Spacecraft Journal, Issue #4, April 1992, pages 1320. - Hathaway,George / 1988 "The Hutchison Effect  A Lift and Disruptive System". "4. The Hutchison Effect; Rainbow in the Lab: The John Hutchison Story; Electrogravitics: Back to the Future; Thoughts on the Biefield-Brown Effect; Mortons Space Drive"
"9. Tesla Coils and Electrostatics; Anomalous Radioactive Variations; Gravitation and Electrical Action; The Hutchison Effect Apparatus"